On arrival at Gwalior airport/railway station and check-in to the hotel. Munch something at the hotel before you leave for sightseeing. Spend the day by paying a visit to the Gwalior fort, which is one of the largest forts in India. Seek blessing at Vishnu temple which was built long back in the 11th century. Have a comfortable stay at the hotel at night. Leave for Orcha which 124 kms from Gwalior. Have your breakfast and pay a visit the popular temples in Orcha such as the Ram Raja Temple and Chaturbhuj Temple.. These temples were built by Bundela rulers in the 16th and 17th century. Comfortable Stay overnight in Orcha at a hotel. Have your breakfast and drive to Khajuraho. 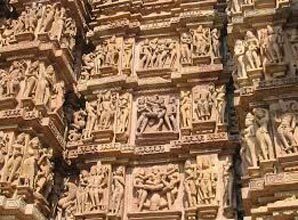 After you arrive at Khajuraho, pay a visit to the Western Group which has 14 temples including Kandariya MahaHave your breakfast and drive to Khajuraho. After you arrive at Khajuraho, pay a visit to the Western Group which has 14 temples including Kandariya Mahadeo, Lakshmana, chaunsath Yogini, Parvati, Varaha, Vishvanath and Nandi, Chitragupta, and Devi Jagdamba. End the day with a comfortable stay at a hotel in Khajuraho. Start the day with sightseeing at the Eastern Group which consists of seven temples out of which four are Jain temples and the other three are Hindu. The seven temples are the Parsvanath, Adinath, Shantinath Ghantai temple, the Vamana, Javari and Brahma. Get back to the hotel and leave for Delhi. Have a comfortable stay at hotel in Delhi. After having breakfast in the morning, Make a transfer to airport/railway station and leave for your onward journey.